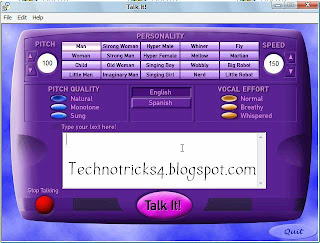 Talk It, also called TalkAny, was a popular text-to-speech (TTS) software by SoftVoice, Inc. and was originally included in the Windows 95 version of Microsoft Plus! under the name of "Microsoft Plus! for Kids". It was used to teach children pronunciation of words and for simple text-to-speech uses, including narration and accessibility.